Serving as the headquarters of the Irish Post Office, the General Post Office is one of Ireland’s most famous buildings. Its construction in the centre of O’Connell Street started in August 1814 and was inaugurated four years late, after the design of Francis Johnston. It was the last of the great Georgian public buildings built in Ireland’s capital. In 1916, the GPO served as the headquarters of the leaders during the Easter Rising. A fire destroyed the building in the rebellion and had not been reconstructed until the Irish Free State government took over this task. 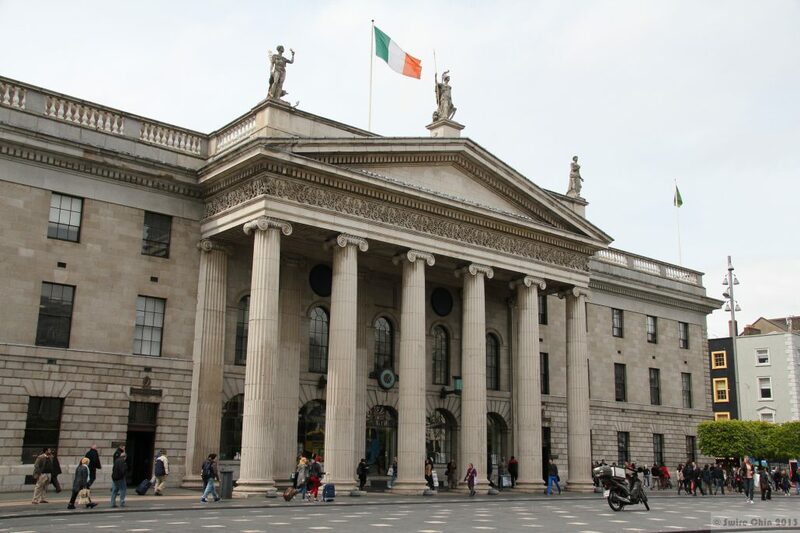 Today, the GPO is Dublin’s principal post office and a famous site to visit. It was the main stronghold of the Irish Volunteers in the 1916 Rising, while today the General Post Office offers a wide range of services. The General Post Office (GPO) is remarkable not just for the special place it holds in Irish history and for its handsome architecture but for the fact that – after two centuries – it continues successfully to fulfil its original purpose as the headquarters of the Irish Post Office. A place of business and public service, of remembrance, protest and pageantry, the GPO deserves the unique place it holds in the affections of Irish people everywhere. The GPO also houses the brand new ‘GPO Witness History’ visitor attraction which opens on March 29th 2016. This will be a highly interactive and immersive exhibition which will focus on the 1916 rising, the aftermath of this rebellion and also how Ireland has developed since. This exhibition will allow visitors to experience the events from an eyewitness perspective of active participants on both sides and bystanders caught in the middle. Touch screens, real artefacts, videos, dress sets and memory walls will further enhance the visitor experience. Visitors will be able to relax afterwards in the café and retail store. This iconic venue will also be available for private functions and events.